14 great songs and a beautifully enhanced CD. After purchasing the CD please consider adding your thoughts to our reviews. Thank you. 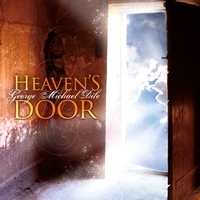 George is a singer songwriter and wrote all 14 songs for Heaven's Door. They are based on his relationship with the Lord. The song Little by Little, for example, speaks of how God's love is changing who he is. As he says in the song "little by little and bit by bit." In fact, he encourages you to buy the physical CD because it's enhanced (inside) with some cool stuff like a Song Study, and a photo for every song and more. And on a few of the songs, he shares what inspired him to write those songs. This Album is truly one of a kind.. It is so well put together.. George Dile, delivers an amazing sound to all his songs. That all you wanna do is keep listening to it over and over..truly the Message is the victory for All of Us to remember. That Jesus is our "Door Way..to Heaven!" amen.. Heaven's Door has been a labor of love, and a work of patience, endurance, and persistence; and the title track reminds me of that. Little By Little is how we grow closer... to Abba; and, by His grace, each other. As sometimes dealing with shut-ins and those neglected, this collection of songs stands out a soothing reminder of the One who is forever faithful. Congrats and 'well done', to a friend and brother. I love George Dile's music, the voice, the recording, the sound and choice of words all have a perfect touch. It's good to the ear and soul. Good work done. Thanks to cd baby for sending my order of George Michael Dile's music to the uk, the songs have strong titles and the words are full of mystery from above. They really quenched My thirst for the spirit of God. I love this cd. Stellar Vocals. Great songwriting. Strong lyrics. You can feel George's love for the Lord through every word and note in these songs. He is using his soulful voice to glorify the Lord throughout this entire CD!! Great! George Michael Dile has delivered His music straight from Heaven in his CD. Truly inspirational music, reminiscent of the 70's, recorded with crystal clarity and perfect harmonies, these songs will lift you up in thanks and praise. And, in addition to hearing George Michael Dile's gifted voice, if you buy the CD (instead of the download), there's come cool "bonus stuff" when inserting the CD because it's enhanced!!! Heavens Door is soulful and inspirational. George has such diversity and some of the songs remind me of B.J. Thomas's sound. It is Beautiful and uplifting! A beautiful CD full of love for God. I could feel the Holy Spirit all throughout the CD in each song. Very nice.